Click here to join our mailing list for more opportunities like this. Can you make 30 pieces of short-form comedy this year? With new talent? For £100K? If so, Channel 4 wants to hear from you! 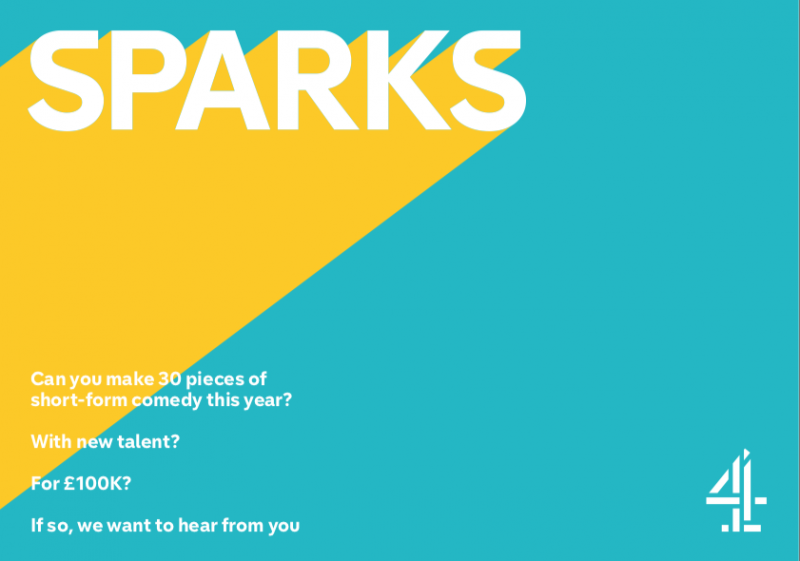 The UK broadcaster has launched a new initiative titled Sparks where they will work with producers to showcase new, brilliant comic voices and test distinctive, bold ideas with a young audience across social platforms such as YouTube and Facebook. Channel 4 plan to engage up to 4 creative partners from across the UK who can each deliver 30 pieces of brilliant, reactive and hilarious content this year on a budget of £100k. Whilst at this stage you may not have specific ideas to share, your proposal will need to demonstrate the creativity your established network will unlock and an outline for how you will manage the budget you are given. You will need to deliver videos – filmed, edited and ready-to-go – in square and 16:9 formats. An understanding of the different platforms is essential. Views and engagement will be the primary measures of success. Produced sketches should have a clear title that will grab the attention of the busy viewer and make them engage, share and talk. If you were given £100k, how would you do this? What talent is on your radar? Who will be the stars of the future? To apply, please send your proposals to Laura Marks, lmarks@channel4.co.uk by Friday 12th April. Fiona McDermott, Head of Comedy at Channel 4, says: "Sparks, and the bolstering of our Blaps proposition, is a really important part of our ongoing comedy strategy here at Channel 4 and we hope it'll be a brilliant runway for new talent, on and off screen. We're genuinely excited to see what comic talent emerges and cannot wait to see how our growing digital audience respond to them." Selected partners will have demonstrated a clear understanding of social media and an ability to unlock talent. Your pitches should include examples of your work and Channel 4 are especially keen to receive proposals from the Nations and Regions. For more info on deal terms, click here.